Here's a quick tip for handling money as you shop yard sales. Keep your coins separate from your cash. 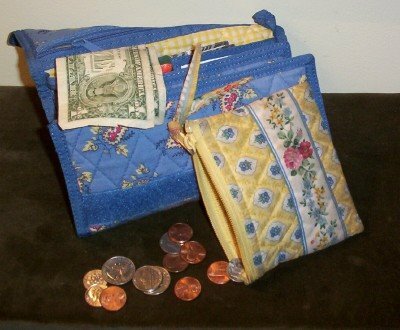 A change purse with hoarded quarters is ideal. You don't want to approach a seller and ask for a better price with a twenty peeking from your wallet! Somehow I always get better prices when I am counting out change, instead. How do you bargain without seeming rude? I always smile, ask "Is this your best price?" and wait expectantly. At least half of the sellers are unsure of pricing and easily agree to a lower amount. I am very shy--so if I can bargain, you can, too! Toward the end of each month, I take all the loose change from our cash envelopes and put them into my yard sale coin purse. I rarely dip into other funds for yard saling unless it is a bigger item that we have been looking for, such as furniture. It embarrasses my husband if I use pennies to pay for something; he thinks it looks too cheap! :-) I use one of those 3 packs of zippered cosmetic bags(Christmas gifts from a great-aunt) to sort my yard sale change. It's easy to just grab and go! I don't comment often, but your blog is the first one I check every day. It's very inspiring. "All I have on me is a twenty." "If I take X, would you mind throwing in Y while I'm at it?" Round numbers are always good. I was going to pay by check anyway, but I got a table and chairs set (solid beech, Danish make, almost-new condition) for $50 instead of the $65 asked for it. $50 is such a nice, round number. I always just suggest the price I want to pay (and I'm shy about this, too, but I've been getting better) -- for example, if the item is marked $5, I'll just ask, "Would you take $3 for it?" I've never had anyone say no. I HAVE had people say, "No." At that point, it becomes my decision whether to walk away or to take their original price. I have done both.